This page was written by Steven J. DeRose on 2003-03-30, and was last updated on 2003-04-12. Harm from radiation is strongly related to both total dose and dose rate. You can take a lot more radiation if it comes in small doses with time to recover from the cellular damage in between. That way more of the radiation goes in directions that don't point exactly at you. If the radiation source is concentrated in one place, doubling your distance cuts your dosage rate by 4. Shielding basically just means a lot a weight. Air is a crummy shield unless we're talking about miles of it; water, dirt, cement, steel, lead, lots of books -- now we're talking real protection. Eventually there will be less of it left; and the mix expected from a nuke decays quickly. Don't even think about leaving a radiation shelter for the first few days; but every day you add makes a substantial difference. If you can stay sheltered for 2 weeks, your survival odds are good. Expedient ones, that you discover or make in a big hurry with whatever is at hand. Prepared ones, that you have designed and built in advance as a safe place. Both kinds have the same goal as far as radiation is concerned: get as much mass as possible between you and the radiation source. Obviously a prepared shelter can be set up to do this really well; but it's surprising how well even the simplest expedient shelters can do. There's a slightly technical but very helpful article on gamma-ray shielding here. In simple terms, just think of every particle of radioactive dust as spraying bullets in random directions. If you're standing in a flat field covered with radioactive dust, every particle of it has a clean shot at you (counting the air as essentially zero protection). If there's a thick cement wall just standing there and you get right next to it, you just cut your dosage rate in half (the radiation on the other side can't get to you), and can survive about twice as long an exposure. 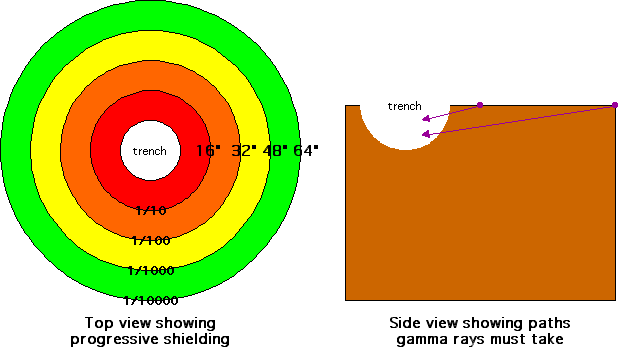 If you quickly find or dig a trench where you can lay just one foot below ground, only the dust right near the edges has much of a shot at you -- gamma rays from the rest have to get through a lot of dirt (at a shallow angle), and will mostly be scattered away. A mere 16" of earth blocks 90% of gamma rays, so all the dust more than a few feet away is no longer a threat. As shown here, the further the dust, the harder time it has getting to you. This approach can get you a very good protection factor (see below). If you can find a big drainage culvert and crawl to the middle with a couple feet of dirt above you, or open a manhole cover and hide in a not-too-disgusting chamber below, you're in great shape -- as long as you can stay there a while. If you have a gas mask (even just a HEPA filtering one from a hardware store), you can be safe from a fair share of what little dust drifts in. If you park your car over the trench, that won't hurt any, either, since it will keep dust from falling right into your hiding place (and keep it at a greater distance -- the height of the car; and provide a little shielding via the car's mass). If you take the dirt you dug out to make the trench, and pile it around the edge to make a mound, you get a slight bonus there too, since moving every now and then to stretch won't be quite so dangerous. A thought exercise: What is the absolute minimum list of stuff you would need to stay for a week in such a place? Now go pack it in a backpack. Don't foget a folding shovel and maybe something to pry a manhole cover off with, so you can make the shelter in the first place. Do your own list first, but if you want to compare mine, it's here. The more shielding, the better. Shielding is measured by what fraction of gamma rays it blocks. If a certain thickness will block half of the incoming radiation, then addding the same thickness again will block half of what's left (leaving only 1/4 or the original gamma ray intensity), and so on. Materials are commonly categorized by their "halving thickness", which is the thickness of that material required to block half of the incoming gamma rays. Sometimes "tenthing thickness" is quoted instead, which is of course the thickness required to block 90%. An overall shield is characterized by its total "protection factor". For example, a shield that only lets 1/40 of the gamma rays through, has a protection factor of 40. This also means that every minute counts in getting into your shelter in the first place. A radiological device that goes off near you starts affecting you immediately; but dust from a nuke that goes off miles away won't settle on your area for some time; you probably have a good 20 minutes before things get very hot. Useful information on materials protection values can be found in the Wikipedia, and on a page by PJ Deschenes and John Burke at North Carolina School of Science and Mathematics. To achieve a protection factor of 1000, use 10 halving-thicknesses or 3 tenthing-thicknesses of any materials, or a combination. It's mainly raw mass of material that makes blocking effective. A pretty good protection estimate is that a one foot square piece of a tenthing-thickness of any material, will come out to weigh about 125 pounds (57 kg). So for a protection factor of 1000, you want about 375 pounds of mass per square foot of area you're shielding. One effective fallout shield is 10 halving-thicknesses of packed dirt, about a yard or meter. Another would be a 9-inch concrete wall (a bit under 4 halvings) backed by 2 feet of dirt (a bit over 6 halvings). Note that 37.5 pounds per square foot will not get you a protection factor of 100 -- it doesn't work that way. It would actually get you considerably less that 10 -- in fact more like a protection factor of 3. Weights per unit area or volume for many more materials are given here.